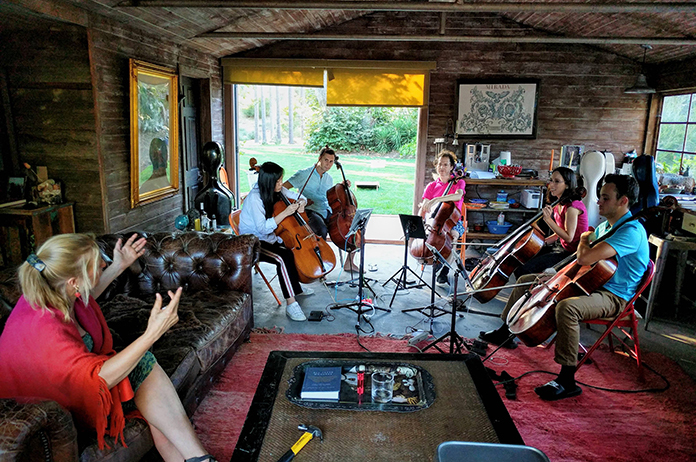 Rehearsing for seven hours a day in Malibu on author Cornelia Funke’s avocado farm might not seem like the most obvious place for a cello quintet to practice, but for Mannes School of Music’s new John Cage Fellow Matt Haimovitz, the space was perfect for his Uccello quintet. The all-cello ensemble is known for their innovative programming, which spans several diverse genres of music, including classical, jazz, and rock, among others. As part of his new Fellowship with Mannes, Haimovitz traveled to Malibu with two students from the Schulich School of Music at McGill University, where he is on faculty, and two students from Mannes. Julian Müller, Professional Studies ‘19, was part of the quintet, where his lessons with Haimovitz left a profound and lasting impact. Haimovitz is acclaimed for both his tremendous artistry and as a musical visionary – pushing the boundaries of classical music performance, championing new music, and initiating groundbreaking collaborations. He made his Carnegie Hall debut at the age of 13, and has since collaborated with musical icons including Philip Glass, Mannes alum Frederica Von Stade, and many others. Haimovitz has also won numerous awards, and was the first classical artist to perform in New York’s famous CBGB. As part of Mannes and the College of Performing Arts commitment to training a musician to succeed in the 21st century, the three schools have been working with renowned artists to create new learning opportunities for students. In addition to Haimovitz, CoPA has recently welcomed acclaimed clarinetist Anat Cohen, who is teaching in the School of Jazz and Contemporary Music, and Bob Hurwitz, former President of Nonesuch Records, who recently became the university’s first Aaron Copland Fellow.